Within the last few years the demand for ready-made pedelecs and e-bikes has increased steadily. The bicycle market has reacted to this by offering customers a wide range of products. To make sure you don't lose track of what's going on, we have put together some tips and decision aids for you in the following. The first question that arises before buying a pedelec or e-bike is: Should I buy a ready-made electric bicycle or a retrofit kit? Once the decision has been made, you will quickly find the right electric bike. Basically, both the purchased and the upgraded electric bikes offer the same selection of components. However, if you want to converse your bicycle, you have to inform yourselfs about which motor or battery suits your existing bicycle. In most cases you can choose from several purchase options. The purchase of a retrofit kit offers the possibility to adapt the technical features specifically to one's own requirements: in addition to maximum current and low voltage cut-off, the strength of the support stages can also be readjusted. While the old bicycle is moved to the basement when a ready-made pedelec is purchased, it can continue to be used by means of a conversion. This is not only a question of sustainability, but also of emotional value. When a new bicycle is needed anyway, than its is obviously the best idea to buy a ready-made pedelec directly. These electric pedelecs have the advantage that their design is adapted to the electric components. Many ready-made pedelecs have a cable duct inside the frame. This makes the electrification unobtrusive. When you buy a ready-made pedelec, you can never ride your bicycle without the weight of the electrical components. The components are firmly mounted and cannot be removed if necessary. Similarly, if your bike is damaged, you lose not only the bike itself, but also the electrical system. The situation is different with a conversion kit: You can disassemble the electrical components and, if necessary, fit them to your new bicycle with minor cable adjustments. This not only keeps you flexible, but also saves you money and resources. Another difference that is often overlooked is the price of spare parts, because even the best battery will eventually exceed its maximum life and a new one must be purchased. Often the spare parts and the service of big brand manufacturers are very expensive and without battery no purchased electric bicycle will work. The follow-up costs should be considered especially with such suppliers. Some manufacturers also tend to discontinue systems after some time without offering further service or spare parts. This means that in the event of a repair not only the individual components have to be replaced, but also a completely new system or electric bicycle has to be purchased. When buying a replacement kit, it is important to have a stable frame with robust dropouts for the running wheels. Lightweight – or carbon frames, but especially dropouts made of carbon are usually not suitable for retrofitting. In such cases the manufacturer should be contacted before the purchase and the feasibility should be clarified. The brake as well as the gears must function perfectly in order to be able to participate safely in road traffic even with an engine. You can find more information on the compatibility of frames, brakes and gears with the respective engine types in our suitability table . If the bicycle does not meet these requirements, we recommend a new purchase. All conversion kits come with assembly instructions and can be converted at home after purchase. Depending on the model and bicycle, the retrofitting takes about three to five hours. The time indication refers to a conversion kit with already laced wheel. This configuration is recommended for everyone. Exceptions are mechanics or hobbyists with suitable equipment. Special tools are required to loosen the crank and attach the magnetic disc. If you don't have the right tool, you don't have to buy one right away. Instead you can borrow our tools. For a small rental fee, the appropriate tool set is supplied directly with the conversion kit. If you don't want to convert your bike yourself, you can also give it directly in to the EBS workshop for conversion. In addition to professional retrofitting, the purchase price also includes a free safety test worth 50€. 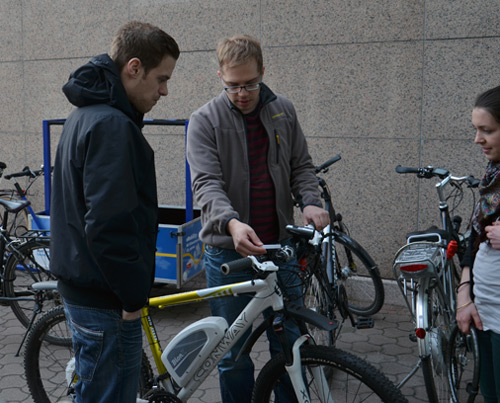 Thus not only an electric bicycle is built up, but the entire bicycle is also checked professionally. The conversion price depends on the special customer requirements as well as on the requirements of the bicycle. On average, the bicycle remains in the workshop for two weeks. If you do not live in the immediate surroundings and do not want to travel there, you can use the EBS delivery service. Your bike will be picked up at your home on the agreed date and taken to our workshop. After the conversion with our EBS Plug & Drive conversion kit, we will send it back to you within 10 working days. You can make use of this service throughout Germany. Before you buy an electric bicycle, consider which type of bicycle is suitable for your application. Almost all bicycle models are now available as e-bike and pedelec versions. When buying an electric bike, make sure you have the right frame height so that you can sit comfortably and safely on the saddle. Often there is advertising with very cheap offers: Be particularly careful here and look at the individual components such as gears and brakes. In most cases, these components save on quality in order to keep the selling price low. A high-quality equipment is more durable and is better suited for the greater stress of an engine. Before buying, it is highly recommended to test ride the electric bicycle. You will have the chance to get to know the geometry and riding comfort of the bike as well as the response behaviour and power of the drive. Depending on which routes you want to travel, you must pay attention to the size of the battery, because this determines the range significantly. To ensure that you always reach your destination, you can easily calculate the range using the following formula: Range (km) = energy (Wh) / consumption (Wh/km). Many suppliers sell second or replacement batteries, which doubles the range and protects the battery. 36V and 48V systems have established themselves for the system voltage, heavier 24V versions have largely disappeared from the market. Also consider the possible failure of the components. Find out which service the manufacturer offers in such cases. Also ask about the prices and availability of spare parts such as battery, motor and charger. A good specialist dealer will take the time for you and can provide you with comprehensive information on all the points mentioned.